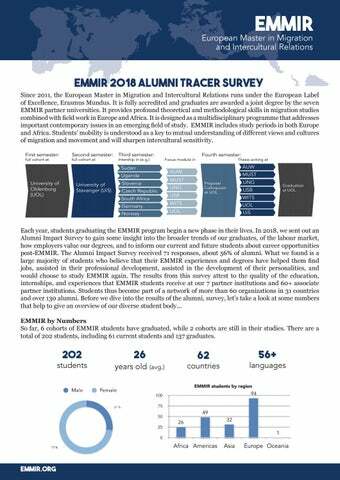 EMMIR 2018 Alumni Tracer survey Since 2011, the European Master in Migration and Intercultural Relations runs under the European Label of Excellence, Erasmus Mundus. It is fully accredited and graduates are awarded a joint degree by the seven EMMIR partner universities. 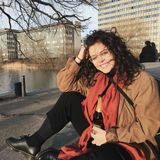 It provides profound theoretical and methodological skills in migration studies combined with field work in Europe and Africa. It is designed as a multidisciplinary programme that addresses important contemporary issues in an emerging field of study. EMMIR includes study periods in both Europe and Africa. Studentsâ&#x20AC;&#x2122; mobility is understood as a key to mutual understanding of different views and cultures of migration and movement and will sharpen intercultural sensitivity. Each year, students graduating the EMMIR program begin a new phase in their lives. In 2018, we sent out an Alumni Impact Survey to gain some insight into the broader trends of our graduates, of the labour market, how employers value our degrees, and to inform our current and future students about career opportunities post-EMMIR. The Alumni Impact Survey received 71 responses, about 56% of alumni. What we found is a large majority of students who believe that their EMMIR experiences and degrees have helped them find jobs, assisted in their professional development, assisted in the development of their personalities, and would choose to study EMMIR again. The results from this survey attest to the quality of the education, internships, and experiences that EMMIR students receive at our 7 partner institutions and 60+ associate partner institutions. Students thus become part of a network of more than 60 organizations in 31 countries and over 130 alumni. Before we dive into the results of the alumni, survey, letâ&#x20AC;&#x2122;s take a look at some numbers that help to give an overview of our diverse student body... EMMIR by Numbers So far, 6 cohorts of EMMIR students have graduated, while 2 cohorts are still in their studies. There are a total of 202 students, including 61 current students and 137 graduates. 55% of students are scholarship holders, while 45% are self-payers. * Currently Norway does not offer a Focus Module semester. ** South Africa first became a full partner during Cohort 7’s mobility. Who responded? 76% of responders were women, and the most respondents were from Cohort 5. 93% of survey respondents are currently employed, while only 3.5% are currently seeking jobs. 41% found their first job after EMMIR through networking. 40% found their first job after EMMIR by applying for a vacancy or spontaneously contacting an employer. 81% of employed respondents work full-time, while 19% work part-time. 95% of employed respondents are salaried. 47% found out about their current job through work contacts or networks. 24% saw an advertisement on the internet or social media. 11% were approached by an employer. 8% approached the employer directly. 80% of employed respondents are working in jobs related to their study programme. 84% believe that the mandatory internships are helpful for their careers. 33% of respondents have 1 job since graduation. 33% of respondents have had 2 jobs since graduation. 33% of respondents have had 3+ jobs since graduation. 20% of respondents have completed further academic qualification. 34% of respondents currently work in the public/government sector. 19% of respondents current work for a non-governmental organization. 15% of respondents currently work for an international non-governmental organisation. 15% of respondents currently work for a prive enterprise. 11% of respondents currently work for a not-for-profit organization. 6% of respondents currently work in the academia sector. 80% of respondents would choose to study EMMIR again.